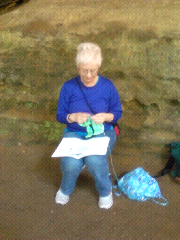 Here I am doing some trail knitting! What top down sweater pattern are you using? That's great! I just started on my winter socks so that's portable enough for me to carry around with me when I go out. Wish I was out in Nature, though. Still, my backyard is wild enough lately to qualify.